Bombing Squadron One Hundred Thirty VB 130 (later designated Patrol Bombing Squadron One Hundred Thirty) was commissioned at NAS DeLand, Florida on 1 March 1943 by Lieutenant Commander Glennon G. Price, A-V(G) USNR. LCDR Price became the first Commanding Officer under the authority of COMAIRLANT, CONF. AirMailGram 152043 OF January 1943. The aircraft designated for Operational use was the PV-1 Ventura. The first two and one half months were devoted to organization and training. 12 AUG 43 All hands flew by Squadron planes to NAF Recife, Brazil via Atkinson Field, B.G., Belem and Fortaleza, Brazil, arriving two days later. 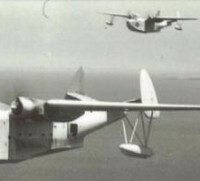 27 AUG 43 After about two weeks of operations at Recife, the squadron was ordered to NAF Pici Field, Fortaleza, Brazil to relieve another PV squadron. Anti-submarine operations continued. 21 NOV 43 A PV-1 flown by LT(jg) Boudreaux, USNR, sighted and attacked an enemy submarine at Latitude 01º 17' S- Longitude 41º 50'W. The extent of damage was undetermined. 27 APR TO 7 MAY 44. 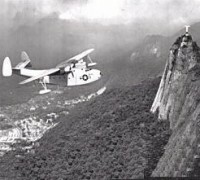 During this period the squadron returned to the United Statesflying all aircraft from Fortaleza, Brazil to NAS Norfolk, Virginia via Miami, FL. 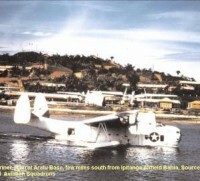 There were two exceptions: One plane was still undergoing repairs at Fortaleza and did not arrive in NA Norfolk, Virginia until 1 JUN 44 while another aircraft caught fire before takeoff at Morrison Field, West Palm Beach, FL and was transferred to Boca Chica,FL. 6 MAY 1944 The Commanding Officer, now a full Commander, was relieved by LCDR Charles R. Dodds, USN, of Annapolis, Maryland. LCDR Dodds had been the Executive Officer during the South American tour of duty.